He was running from his brother Esau. Jacob had tricked his brother out of their fathers blessing, and now Esau was so angry, he wanted to kill him. So Jacob was traveling east, to the land where his grandfather Abraham was born. He was also hoping to choose a wife from his grandfather's family. Early on a warm afternoon, he came to a well in the fields outside the town of Haran. The well was just like the one that his grandfathers servant had come to many years before, when he was looking for a wife for Isaac. It may have been the very same one. Three flocks of sheep were lying in the fields beside the well, waiting for their shepherds to water them. There was a large stone covering the well, and the shepherds had to wait until all the shepherds were there before they could move it. Then you must know my uncle Laban! He is from Haran, Jacob said. Yes, we do, the shepherds answered. Is he well? Jacob asked. At that moment Rachel arrived with her fathers sheep. When Jacobs eyes met Rachels, it was as if the world came to a stop. The crying of the sheep, the laughing and talking of the shepherds, all seemed to disappear. It was as if there was no one else in all the world but the two of them. 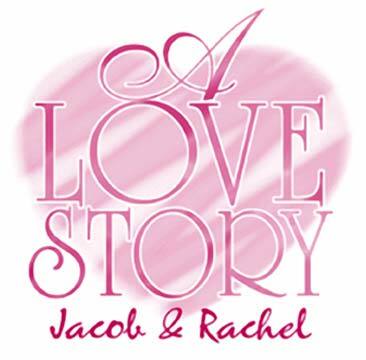 Jacob fell so deeply, crazy in love with Rachel, that he walked over to that huge stone and rolled it away himself. "Here, now you may water your sheep!" he said to Rachel. I am your relative. Your aunt Rebekah is my mother, he told her at last. Rachel ran home to tell her father all that had happened. When her father heard the news, he ran to meet Jacob. He hugged and kissed this nephew he hadn't known until now, and brought him to his home. And so Jacob worked for his uncle for seven years. But to Jacob, the years seemed like nothing at all. Just to be near the one he loved was enough to fill his heart. Finally, the day came that Jacob had worked for all those years. At last, Laban gave his daughter Rachel to be married. There was a great wedding feast. And that night, under a sky of shining stars, Rachel came to Jacobs tent. She was wrapped from head to foot in layers of veils and flowing robes. Jacob took her by the hand and led her inside. He wrapped his arms around her and held her tight. They were alone together at last. And that night, in the eyes of God, Rachel became Jacobs wife, and he became her husband. Before that night they were two separate people. Now God had joined the two together, and they became one family. But, when the light of morning came, Jacob awoke to a big surprise. It wasnt Rachel he had married at all! It was her sister Leah he was lying beside! Jacob jumped from his bed and ran straight to the tent of his Uncle Laban. Well - look who's talking! The cheater got cheated. He didnt like it very much. And so Jacob agreed, and Jacob and Rachel were married at last. Jacob worked for his uncle another seven years. He would have gladly worked a hundred, he loved her so deeply.